Estate and Insurance Appraisals by Master Gemologist Appraiser. Being a qualified appraiser, requires, education and proper training in appraisal writing. When looking for an appraiser for your jewelry and watches it's important to select one who is qualified, independent, and has all of the proper educational qualifications. An independent appraiser is completely unbiased and will grade your jewelry and watches based solely on true market value. It's also important for the appraiser to be a graduate gemologist from the "Gemological Institute of America", a member of "The American Society of Appraisers" and the "National Association of Jewelry Appraisers". Being a member of these organizations, the appraiser is committed to a code of ethics set forth by the appraisal industry. Being a member of these organizations also ensures that the appraiser is committed to continual education and keeping abreast of industry changes that may affect the value of your jewelry and watches. The Master Gemologist Appraiser® certification mark is the most highly respected designation in the Gems and Jewelry appraisal profession. Duane has fulfilled all of the requirements needed to become a MGA (Master Gemologist Appraiser). Jewelry/Watch appraisals are by appointment in a professional secure office. 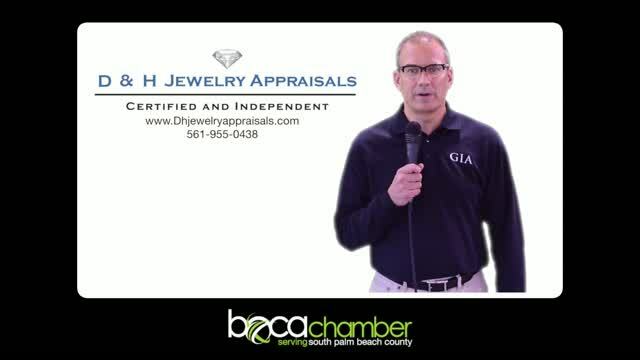 Most appraisals are completed while you watch, so your jewelry never has to leave you. Same day appointments are generally available and you will leave with your printed/bound appraisal at the end of the appointment. We will answer any questions and explain the process as we are doing the appraisal. Contact us today at (561) 955-0438 or email us at [email protected] for more information about our quality and unbiased services.